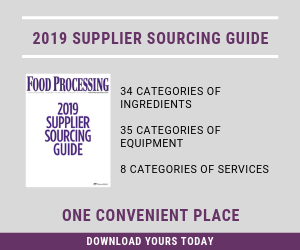 The year in review recalls some of the most important events of 2014, and the 2015 Supplier Sourcing Guide Directory is a look forward – a tool we hope helps you throughout the new year. Download your copy of the Supplier Source Guide. A monthly round-up of food and beverage manufacturing equipment chosen by our editors. A monthly round-up of food and beverage ingredients chosen by our editors. Add flavors and functionality to your formulations with this month's ingredient round-up.